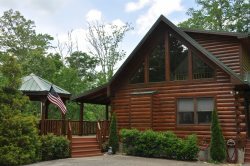 We had an amazing trip here at your cabin and Bryson City. This was a first ever non beach family vacation and we can't wait to come back. It was just what we needed to de-stress. The cabin is absolutely perfect, well stocked and just like home. The extras like the hot tub and game loft were great. We can't wait to return. Everybody that I talked too was very friendly and helpful. The folksI spoke to very knowledgeable and extremely friendly. Thank you for the lovely stay at your beautiful cabin. The stay was worry free. It was everything we expected. Everyone was wonderful. Melissa, in particular, was very helpful and a pleasure to speak with. Had an absolutely wonderful time. Thank you for letting us stay in your beautiful home! We enjoyed the trail to the water fall as well. Everyone we talked to was very friendly and a pleasure to work with. We had such a great time! It had been 10 years since we could go on vacation. GSCR is on of the nicest places and could not have asked for more. Hope to return sooner than 10 years. This place is absolutely beautiful! Everything we hoped for and more! You have surpassed our expectations! We have enjoyed the cabin tremendously. About 50 of us gathered on Baines Mountain for our first family reunion. We had many laughs and enjoyed the hikes and water activities! We will definitely be back.